After classes at New York's International Culinary Center, Naadhira Ismail would walk past the school's bakery, inhaling the scent of sourdough loaves that students turned out. They could help themselves to the goods too, and the pastry student became enchanted with bread. After completing her course at the centre, formerly known as the French Culinary Institute, she worked for French bakery chain Maison Kayser and, later, Runner & Stone, a bakery in Brooklyn, before coming home. Two months ago, she opened Mother Dough Bakery in North Bridge Road, naming it after the sourdough starter used to make good bread. Her loaves, including a Baby Baguette ($2), are crusty and craggy, and have the tang of good sourdough. Toasted and spread lavishly with salted butter and drizzled with honey, the baguettes make for compulsive eating. But the 32-year-old started as a pastry student after all and her almond croissant ($4) is smashing. Many bakeries make them with unsold croissants, but at Mother Dough, they disappear so quickly that she makes croissants just for this treat. Bite into one of these beauties, studded with sliced almonds, and there is crisp lightness and then not-too-sweet cream flecked with brown from almond skin. Cue waves of pleasure. The croissants are more compelling than the plain ones ($3) or those stuffed with chocolate and almonds ($4.40); turkey ham and cheese ($4); cheese ($3.40); and beef pepperoni and cheese ($3.80). Her wares sell out fast, but if Lemon Cake ($4 a slice) is available, pounce. The pound cake has a velvety crumb and is not too dense. It has a bright lemon flavour and I don't even mind the drizzle of icing on top. It looks lethally sweet, but is not. The Banana Walnut and Chocolate Espresso cakes ($4 a slice) have perfect texture, but the bananas need to be more ripe and I would like a stronger coffee flavour. Mostly, I am happy with my almond croissant or lemon cake and a cold brew tea ($6) and I always leave with a Baby Baguette (or three) for when I need a bread fix. And to think, before culinary school, Ms Naadhira "baked for fun". After a decade organising fashion events in Singapore, she took the plunge and went to New York. "I had a good feeling about it," she says. For a few blissful weeks, I haunted Prodigal Roasters in Ang Mo Kio, glad to have excellent coffee near work and home. One Sunday, I popped in for a cappuccino and found that it was the last day of operations. Fortunately, I can still get my fix - I just have to go to MacPherson. There, in a maze of Housing Board blocks, Prodigal has a larger, brighter cafe which opened in February. On the menu are its excellent cookies, cakes and other bakes, and more substantial food offerings. Coffee, however, is a must. If beans from Thailand and Myanmar are available, even better. The Thai beans, from Chiang Rai, are full of power, waking me up immediately. The brew reminds me of local kopi, which powers so many of our mornings. The Myanmar beans make a smooth, slightly herby and sweet cappuccino ($5). Both are satisfying in their own way. The cafe also sells cold coffee in bottles. I love the Magic ($6.50 for 250ml), two ristretto shots with milk. I'm working up the courage to go for the three-shot Tragic ($7 for 330ml) and hope I will never need the four-shot Logic ($7.50 for 340ml). Owner Glen Ho, 31, got into coffee after a friend pulled him a shot at home. He started making his own using a 10-year-old coffee machine and then bought a popcorn popper to roast his own green coffee beans. It broke down and that led to his getting a proper roaster, and eventually opening a cafe. As much as I need coffee, I also need food. If it is available, the Bak Kwa & Cranberry Scone ($3.50) is a must. Warm, buttery and tender, need I say more? The Miso Cheese Tart ($6), drizzled with miso caramel, has a phenomenal crust and I would like more of that caramel. Mr Ho should bottle it. Ground coffee goes into the Brownie ($5), deepening its chocolate flavour. 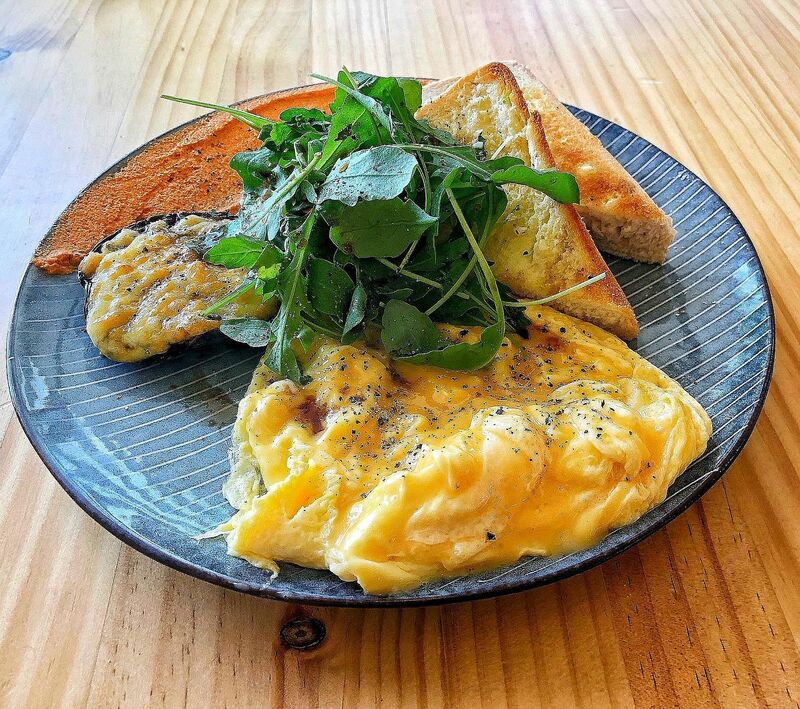 For something more substantial, order Mushroom Egg Toast ($15, above). Thick-cut sandwich bread, lightly toasted, comes from a heritage bakery in Whampoa. The softly scrambled eggs and grilled portobello topped with cheddar go down easily, but what I love most on that plate is the smear of red bell pepper hummus. I don't even mind going out of my way for it. It takes courage to serve unpretty food these days, when style so often trumps substance and looks trump taste. The Salted Plum in Circular Road has that courage. The restaurant, which grew out of a pop-up in South Bridge Road called Five Ten, serves Taiwanese-inspired small plates, which cost $5 or $10 for the most part. At lunch, the restaurant serves $10 lunch bowls for the office crowd, but the dinner menu is far more interesting. Bamboo Shoots ($5) braised in pork broth tastes clean and I cannot get enough of the juicy shoots. Also good are the crackly-skinned Smashed Baby Potatoes ($5) sprinkled with plum powder, a decidedly weird combination which works. From the $10 part of the menu, I order two pork dishes, which do not stand up to scrutiny. Pork Chop is described on the menu as "juicy af". It is not. The pork is sliced too thin so the meat dries out. Haus Bacon is similarly lacklustre. It comes without the promised raw garlic, but I doubt even that would have made it better. There are, however, dishes to like. Oyster Steamed Egg ($10) is delicate and wobbly, the flavour of the homespun dish amped up with dashi and fat little oysters. 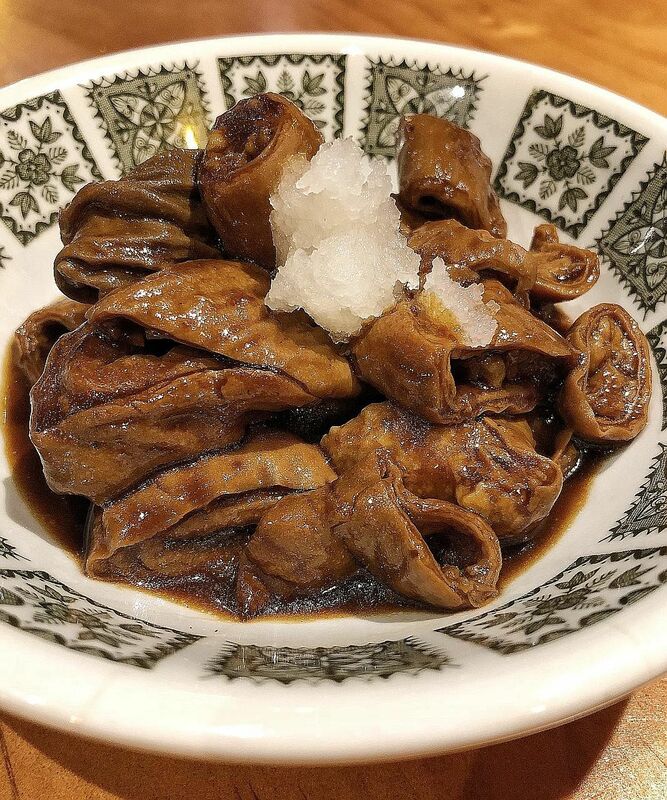 Braised Pig Intestines ($10), soft from long cooking in a rich soy braising sauce, has no trace of funk. Spoon the gravy over Shiny Rice (50 cents), slicked with lard and garlic oil. The kicky chilli sauce is perfect with the offal too. Brussels Sprouts ($10), sweet from severe charring and piled unceremoniously on a plate with shiitake mushroom slices and salted pork, is supremely ugly, but infinitely delicious. 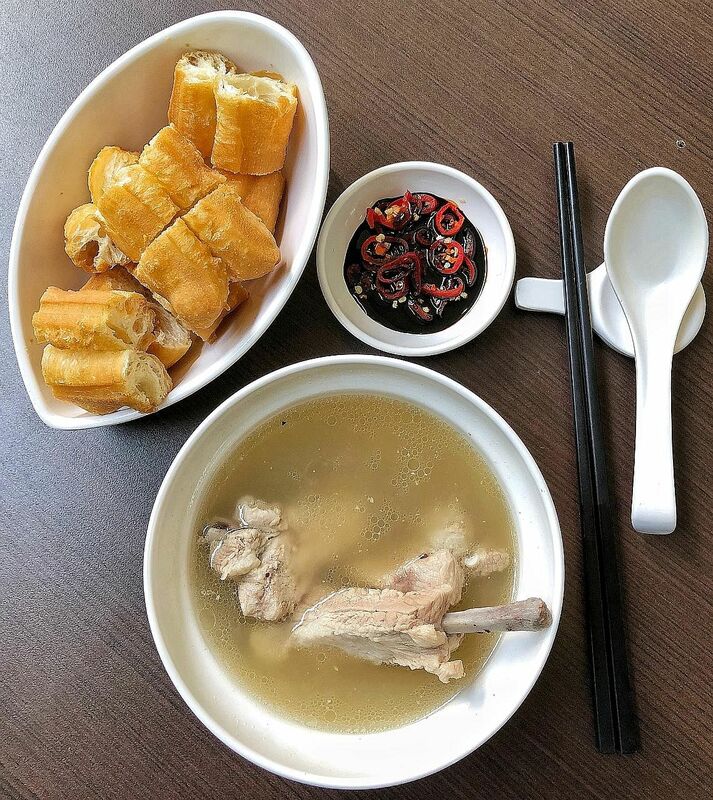 Back when The Straits Times and Lianhe Zaobao ran the annual Hawker Masters programme, we were stunned one year when we could not find a worthy master for bak kut teh. The finalists for that category were underwhelming; turning out thin broth with no meat flavour, broth that tasted overwhelmingly of pepper and pork ribs that were too dry. If Tuan Yuan Pork Ribs Soup had been open then, it would have won. It serves bak kut teh Singapore can be proud of. The broth is simmered three times in different vats, each time becoming heartier yet remaining clear. You can get it without pepper, with pepper or with extra pepper. The regular amount of pepper is just right - it won't blow your head off, but the broth is still plenty aromatic and robust. A regular bowl costs $8, but I pay $1 more for Spare Ribs Soup because I love those juicy, fatty pork ribs. Customers can opt for lean ribs too. Youtiao ($2), or deep-fried crullers, are perfectly crisp and not oil-logged and they soak up the broth very well. I find the Salted Vegetable ($3), Braised Peanuts ($3) and Pork Stomach Soup ($8) quite forgettable, and the Pork Cartilage Soup ($8) was too salty when I last had it. But I would make room for Pork Ball Soup ($6), full of umami from dried sole fish worked into the meat. The best part of the meal, however, is lifting the lid on a bowl of bak kut teh and inhaling the aroma of the broth. Then I turn the lid over, to use as a plate for bones, and demolish the bowl.